A strike by Health workers at Mbale Regional Referral Hospital has entered a second day with scores of patients lying in the hospital unattended. 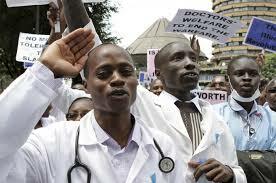 17 intern doctors, 6 pharmacists and 14 nurses have resolved not to report for duty until their demands are met by the hospital administration and ministry of health. The students argue that they have not been paid allowances since August yet the hospital administration does not cater for their meals. They also say they are they are living in dilapidated houses where they share toilets with taxi drivers who operate along Pallisa road. In the hospital Wards there are only a few nurses, senior doctors and consultants. But in the Out Patients Department, hundreds of patients are queuing to see the few available doctors. Meanwhile, interns at Soroti regional referral hospital have also laid down their tools over nonpayment of their unpaid salaries and allowances since August. They say they are living under deplorable conditions. The chairman of the interns Isaac Orec, says their landlords have already issued eviction notices for some of them. He says they recently wrote to the Ministry of Health Permanent Secretary and the Health Minister but they are yet to receive feedback on when payment of their payments will be effected. The striking students have also been joined by the hospital cleaners who are protesting poor pay and working conditions.